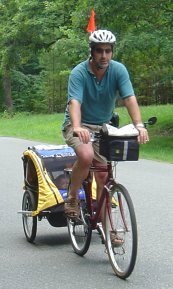 In the summer of 2005 we had moved into town and wanted bicycling to become our main mode of transportation. I needed something to put my daughter in and thought that a seat mounted on the bike would be the best option, so off I went to The Clean Machine in Carrboro to get prices. I spoke with one of the employees named Chris and he gave me some pricing information for the seats which seemed very affordable. While walking in, I noticed a trailer on display in the front window. I asked Chris about it and he raved that it was the only way to go. He had a child about 2 years old and used it himself, so it wasn't just a sales pitch to get me to buy something more expensive! The price tag seemed a little hefty so I thought I would go to ebay to try to save some money. After watching the sales for a couple of week, I realized that they were going for $300(and new one was about $430) plus shipping. Some of them were 6 years older or more and with new innovations coming up every year I would be saving a little over $100 and not know what I'm getting. On the other hand, if I can use this one for 3 years and sell it for $300, I would be "renting" it for $40 year. I had also looked at other trailers that were less expensive as a way of saving money but they did not seem as rugged as the Burley(actually some of them were downright flimsy!). They cost about $200 less, but in the words of a friend who bought a cheap one and returned it after one trip, "I'm not going to put my son's life in the hands of that flimsy thing!". The decision being made I went to order one from The Clean Machine. I placed the order and was told that it would be 3 weeks. It ended up being 9 weeks(These trailers are IN DEMAND- thus the high ebay prices!) before I recieved it. I had a quick set up lesson, put it in my truck and took it home. 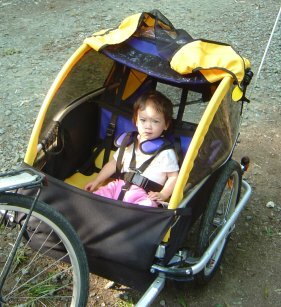 The next step was to hook it up to my bike and then the biggest step- put my daughter in it and hope that she likes it! I had visions of her going into screaming fits as I set her in the seat, but it was all for naught- She loves it and now we bicycle all over town and rarely use the car. With the price of gas, the trailer will probably pay for itself in a year or two with the money we saved on gas! the BEST AIR FARES & HOTEL RATES!